Day 4: Kyoto - oh no, not more trains! Yes, more trains. Get used to it. We told you this place was full of them. And besides, this one is special. This is the very first Shinkansen that Timmy got to ride. 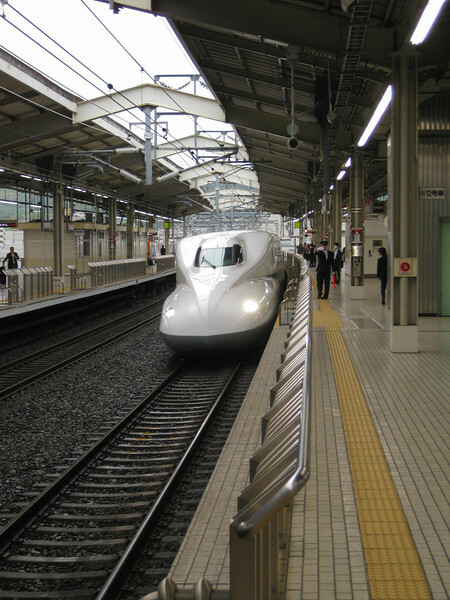 In case you don't know, "Shinkansen" literally means "new trunk line", and refers to a new high-speed train line that the Japanese built between Tokyo and Osaka just in time for the 1964 Tokyo Olympics. Up until that time, much of the world thought Japan was still sifting through the rubble left by World War II. But when they turned on their TVs to watch the Olympics, and saw images of these "bullet trains" (the first Shinkansen models were shaped like bullets) zipping past Mt. Fuji, everyone realized the phoenix had arisen from the ashes.